Very elegant. Mine is a little more modest today. The pink daisies are giving to that severe door a great touch of charm! Charming and so elegant doorway! I love the flowers as well! I LOVE the amphoras and the flowers! Symmetrical perfection! Apart from that darn pipe down the one side of the door..oh no hang on, there's one at the other side too!! 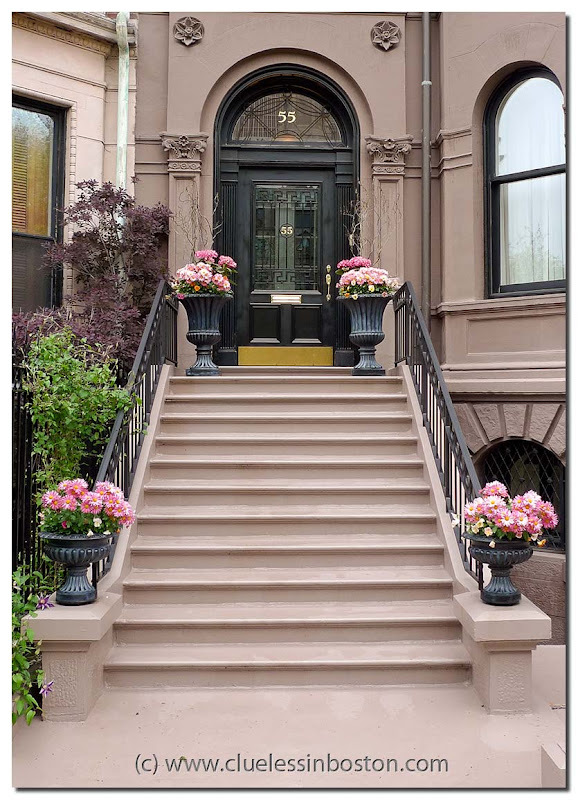 The doorway was beautiful and elegant already, but dressing it up with the four floral urns completes it. This is gorgeous!!! I am totally a nut for front doors, entries and approaches. Wonderful capture! More lines here that works perfectly with the door... the pots on each side, love this !